In just a year, Nogordola has probably achieved what no other boutique could accomplish- a signature mark. The house can easily be recognised through their well researched, theme based motifs on the clothes they design. Rather than allowing the occasions to dictate style, they design to dictate style. From paintings of Qamrul Hasan, ancient kalamkari, and aborigine drawings to the pastoral patterns on shondesh, their reflection on the attires of Nogordola has been exceptional and unique. Nogordola is a handicraft and handloom project of Dhaka Ahsania Mission and have recently, opened their second outlet at House # 3-G, Road # 11, Banani, reiterating their unique commitment for exploration of culture and to raise true and aesthetic beauty through the attires they design. "Nogordola will uplift the local tradition and heritage. It will come forward to find out the country's roots. I hope it will continue its contribution for the welfare of the country," said Masayuki Inoue, Ambassador of Japan to Bangladesh on the ceremony arranged in celebration of Nogordola's first anniversary. A daylong programme was organised to celebrate the day. 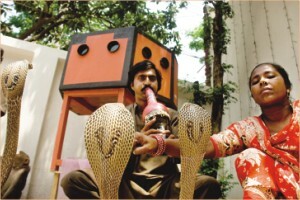 A musical troupe rendered popular folks songs, while snake charmers mesmerised the audience with their bin and dancing serpents. A fashion show was also arranged to highlight their new designs for the coming Boishakh.